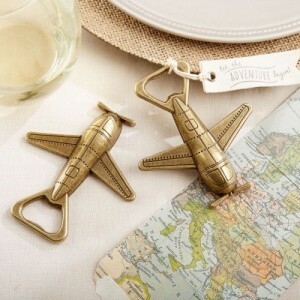 Which brings me to today’s fun wedding favor – a bronze airplane bottle opener! I love the vintage look of this bottle opener. And not only is it fun, but it’s also practical. You could use the bottle opener at the reception as a place holder or you could include it in the “welcome bag” that you’re making up for your out-of-town guests. No matter how you use it, your guests will love this classic keepsake from your big day! You can find this fun wedding favor here.